If you’re searching for a holiday that’s jam-packed with outdoor adventures and awe-inspiring nature, look no further than America’s national parks. With a choice of 59 parks across 28 different states, you won’t struggle to find the perfect place for your next trip. US national park holidays take you to some of the world’s most diverse and stunning natural playgrounds. Nature-lovers can revel in the scenic beauty and abundance of wildlife, while thrill-seekers have the opportunity to hike, bike, climb and raft among the dramatic landscapes. From the rocky and weather-beaten shores of New England to Florida’s tropical white-sand beaches, the national parks in the east offer a range of unique scenery and wildlife. The Great Smoky Mountains are home to black bears and antlered elk, while alligators and panthers stalk the Everglades in South Florida. Explore the longest cave system in the world in the Mammoth Cave National Park, with its mighty stalagmites and stalactites and over 400 miles of underground rivers. With echoes of America’s wild frontier, this region is brimming with Old West history and Native American culture. Discover for yourself the astounding beauty of Yellowstone, America’s oldest National Park. From hot springs and geysers, to bison and grizzly bears, you’re bound to be captivated by the the vast range of scenery and wildlife on offer. The Rockies is the perfect place for thrill-seekers. As well as the jaw-dropping splendour of the mountains, the area has over 150 lakes and around 450 miles of streams, making it ideal for watersports such as canoeing and white water rafting. A trip to the southwest will bring you to one of the greatest natural phenomenons in the world - the Grand Canyon. Carved out of multicoloured rock strata by the Colorado River, the canyon is one of America’s most popular tourist hotspots and offers plenty of hiking trails. In southwest Utah, the Zion National Park has some hair-raising slot canyons to rappel down, while Bryce Canyon shows off an impressive landscape of towering rock formations. Waterfalls, volcanoes and rainforests - America’s West Coast has it all. 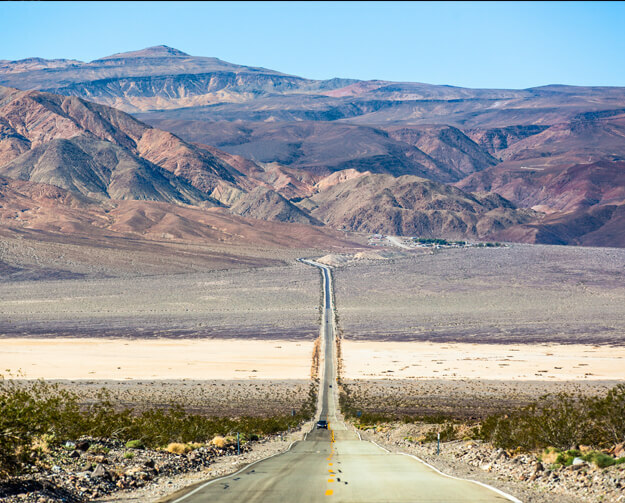 Witness the majestic glory of a Yosemite waterfall, navigate your way through an Olympic Park rainforest or see the incredible Badwater salt flats in the searingly hot Death Valley. The parks in California and the Pacific Northwest are home to some of the most breathtaking scenery and stunning walks the US has to offer. The protected forests at the Redwood National Park have some fantastic natural trails, while the North California coast offers a variety of wild and rugged beaches. At Azure, we’re dedicated to providing you with the best holiday possible. Our selection of high quality accommodation blends seamlessly with the magnificent surroundings and offers guests the perfect base from which to explore America’s national parks. Don’t hesitate to get in touch with us to find out more about our tailor-made holiday packages. Our helpful advisors are just a phone call away and will be delighted to help you create the perfect itinerary.